During the busy lunch hour, passers-by and hungry shoppers on Lake Street eagerly stood outside the ABC 7 studios today to watch Duce Raymond (nephew of 'Sweet Baby Ray') as the smell of barbecue wafted along the street. During the 11 a.m. news, Chef Raymond explained the difference between St. Louis Spare Ribs vs. the better-known Baby Back Ribs. Sweet Baby Ray's Barbecue Restaurants has both on the menu, but sells more Baby Backs (9 to 1). Anchors Linda Yu and Sylvia Perez were eager to taste Chef Raymond's New Orleans Style Barbecue Shrimp and Green Chili Mac 'N' Cheese which he also demonstrated live in front of a crowded sidewalk of fans. 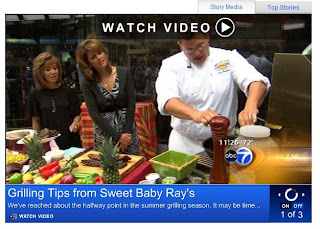 Recipes for the Barbecue Shrimp and Mac 'N' Cheese can be found at the ABC 7 Chicago Web site. Sweet Baby Ray's has two restaurant locations (249 E. Irving Park Rd., Wood Dale; 630-238-8261; and 800 E. Higgins Rd., Elk Grove Village; 847-437-9555). For the complete menu and other information about the restaurant and catering program, visit http://www.sbrbbq.com/ or http://www.sbrcatering.com/. Jennifer Aniston and John Mayer almost at Shochu!